Although motorcycle accidents are a constant worry for both riders and drivers, the rider is much more likely to suffer serious injury or death in a crash. According to the National Highway Traffic Safety Administration (NHTSA)'s Traffic Safety Facts for Motercycles, motorcyclists are over five times more likely to be injured—and 25 times more likely to be killed—than drivers and passengers in cars. Even when a motorcyclist survives an accident, injury treatment can last for years or even result in permanent disability. Head-on collisions. Vehicles striking motorcycles from the front account for nearly 80% of all motorcycle-car crash deaths. This is due to the high likelihood of head injuries as the rider is thrown onto the hood of the vehicle and then onto the pavement (or into the path of vehicles following behind). Left-turn accidents. Turning left is the most dangerous traffic maneuver for motorcycle riders, accounting for nearly half of all car-motorcycle collisions. Cars may strike the motorcycle as it enters the intersection or as a turning car hits a rider traveling straight, causing a side impact (t-bone) crash. Injuries to the motorcyclist may be extensive in these cases, as there is moving traffic on all sides of the rider. Rear-end crashes. These crashes occur when a car is following too closely behind the motorcycle, causing the car to strike the back wheel of the bike. Although less likely to be fatal than head-on collisions, a rear-end accident can still result in severe neck and back injuries that prevent a rider from earning a living. Sideswipe collisions. While a driver may check for cars before merging or changing lanes, they also have a duty to look out for all types of vehicles, including motorcycles. Drivers often claim that they “didn’t see” motorcycles due to the bike’s smaller size and profile, causing them to collide with the side of a bike traveling next to them. No-contact crashes. Drivers can cause injuries to motorcyclists even when they do not make contact with the bike. Many bikers crash as a result of avoiding a vehicle that swerved into their path, such as when a passenger opens a car door into traffic or drifts into the motorcyclist’s lane. 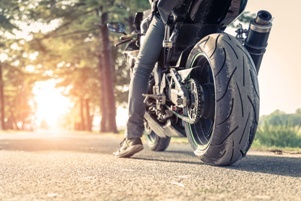 A biker who is unable to stop may be forced to “lay down” the bike or speed off the side of the road, resulting in a collision with a fixed object or bodily trauma as they are thrown from the motorcycle. Road hazards. Dangerous conditions on streets and highways that damage cars can be fatal for motorcyclists. Potholes, spilled gravel, slick surfaces, debris, roadkill, gradient changes, cracks in the pavement, and a lack of warning signs or signals all have the potential to cause a rider to spin out of control. Other irregularities or unexpected objects in the road pose a serious safety threat to motorcycles. Motorcycle defects. In some cases, neither the motorcyclist nor the driver is principally responsible for a crash. The maker of the motorcycle could be liable if a defective design or malfunctioning component caused the biker to lose control. Similarly, a mechanic can be at fault if the repairs or maintenance on the bike failed to perform properly, such as installing bad brakes or faulty tires. If you have been injured in a motorcycle crash, we can help you get proper compensation for your medical bills, loss of income, damage to your bike, and pain and suffering. Fill out the quick contact form on this page to have the attorneys at GriffithLaw explain your rights in your free case evaluation, or order a free copy of our book, The 10 Worst Mistakes You Can Make With Your Tennessee Injury Case. Is Motorcycle Lane Splitting Legal In Tennessee?